2.Chobani Flip: Key Lime Crumb low-fat yogurt with graham cracker and white chocolate and Vanilla Golden Crunch low-fat yogurt with cornflakes, honey oats and praline pecans. I also like Honey Bee Nana and Almond Coco Loco, and can't wait to try Peachy Pistachio and Blueberry Power. 4. 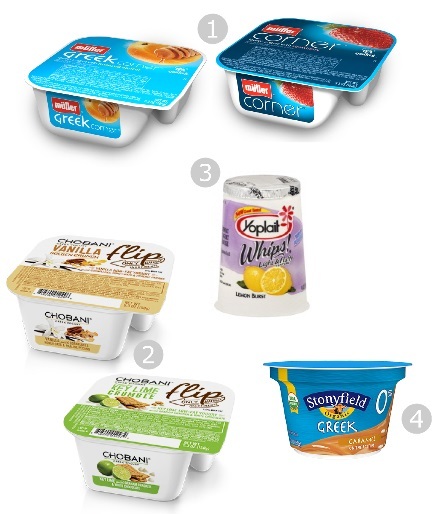 Stonyfield Organic: Caramel Greek Yogurt - contains twice the protein than regular yogurt and is as much of a dessert as it is a nutritious snack.